Today for us there are at least two problems with reading Aristotle’s poetry. The first is that it’s poetry that is Greek. The second is that it is Aristotle’s. Let’s read anyway. It is obvious in the first place that Greek literature is the impersonal literature. Those few hundred years that separate John Paston from Plato, Norwich from Athens, make a chasm which the vast tide of European chatter can never succeed in crossing. When we read Chaucer, we are floated up to him insensibly on the current of our ancestors’ lives, and later, as records increase and memories lengthen, there is scarcely a figure which has not its nimbus of association, its life and letters, its wife and family, its house, its character, its happy or dismal catastrophe. But the Greeks remain in a fastness of their own. Fate has been kind there too. She has preserved them from vulgarity. Euripides was eaten by dogs; Aeschylus killed by a stone; Sappho leapt from a cliff. We know no more of them than that. We have their poetry, and that is all. and at once the mind begins to fashion itself surroundings. It makes some background, even of the most provisional sort, for Sophocles; it imagines some village, in a remote part of the country, near the sea. The problem of reading Greek writers is fairly discussed, and Woolf admits, “We have their poetry, and that is all.” But, she allows something more to get beyond the difficulties. At first glance, it seems that “any play by Sophocles” solves our problem. It opens our mind, she suggests, to our familiar. But that only returns us to the place we start: we have “our ignorance” and “we do not know.” The title of Woolf’s essay, of course, is “On Not Knowing Greek,” as in her book, The Common Reader. 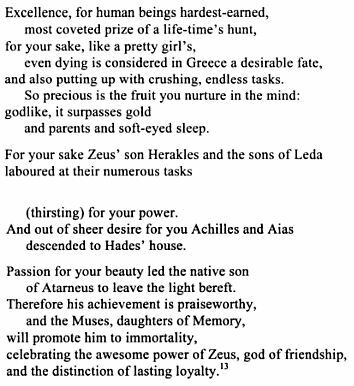 An enjoyment of Greek poetry is certainly a proper, and not a mercenary, reward for learning Greek; but only those who have reached the stage of enjoying Greek poetry can tell from their own experience that this is so. The schoolboy beginning Greek grammar cannot look forward to his adult enjoyment of Sophocles as a lover looks forward to marriage or a general to victory. He has to begin by working for marks, or to escape punishment, or to please his parents, or, at best, in the hope of a future good which he cannot at present imagine or desire. His position, therefore, bears a certain resemblance to that of the mercenary; the reward he is going to get will, in actual fact, be a natural or proper reward, but he will not know that till he has got it. Of course, he gets it gradually; enjoyment creeps in upon the mere drudgery, and nobody could point to a day or an hour when the one ceased and the other began. But it is just insofar as he approaches the reward that he becomes able to desire it for its own sake; indeed, the power of so desiring it is itself a preliminary reward. What Lewis is describing is from his own particular experience (as he relays that for general consideration to an audience in a sermon he preached, which we all can hear a bit of here as produced by somebody else some years later). 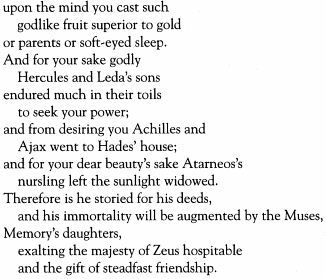 The point is that reading Sophocles or Greek poetry in general may be difficult, especially at first, when one is initially attempting somehow to “know” it. Elgin makes her observations about us in around 1997, in her wonderful book, Between the Absolute and the Arbitrary. She’s saying that we don’t even really use Greek (not the alpha-bet nor the sounds they represented) when we read of Aristotle and speak of him with one another. How can we understand, or know, his works? How his poetry? Our friends the philosophers have begun to take more note of the Rhetoric in their study of Aristotle, not out of a willingness to approach philosophy as a rhetorical discourse but in apparent hopes of weaving material from the Rhetoric more tightly into the network of Aristotle’s philosophy. All too many students of Aristotle are, in their hearts, Platonists. I am not only content, but delighted, when Professor Farrell proclaims that I am not a Platonist. Not everyone has noticed. . . But suppose Aristotle had, as Plato did, explored the philosophical issues of rhetoric and inserted some such discussion into the text [of the Rhetoric]. We can reconstruct, either in his language or in postmodern language, what he might have said about political and ethical functions of rhetoric. If he had done so, I would suggest, some of us at least would now be engaged in deconstructing his remarks along the lines of Derrida’s deconstruction of Plato’s Phaedrus. That is to say, we would be exploring the slippages between a logocentrist position that gives some fundamental moral meaning to rhetoric in society and what Aristotle actually does in the text [of the Rhetoric] as a whole. Virtually every category and strategy discussed can be used for opposed moral purposes, and the only criterion we are offered is the parenthetical remark that we should not seek to persuade what is “base.” It is perhaps not too much to say that the central problem with the Rhetoric for those who approach it philosophically is that it comes to us already “deconstructed,” filled with différance, supplements, and “traces.” Ethical meaning is constantly differed, and key terms such as topos constantly repeat themselves both as the same and as different. . . .
My suggestion to the philosophers. . . is that instead of reading the Rhetoric as a work of philosophy they should try reading Aristotle’s major treatises on other subjects as rhetorical constructs. They might, for example, begin to observe the system of imagery prevailing in the Nicomachean Ethics, which is filled with teleological, emotionally based metaphors. What appear on the surface to be rational arguments are at the most usually enthymemes, not syllogisms, and their persuasive quality is often derived from ethos and pathos. They should explore also the concept of audience in each of the treatises, seen for example in the patterns in which Aristotle shifts from use of the first person singular to the first person plural. Kennedy is contending, against philosophers (perhaps “straw-man” philosophers), that he knows and that they should know Aristotle rhetorically, even when Aristotle is purporting to being philosophical, ethical, or logical. If we know Greek philosophy as rhetorical, then how would we know Aristotle’s poetry? Aristotle is perhaps no great shakes as a poet. 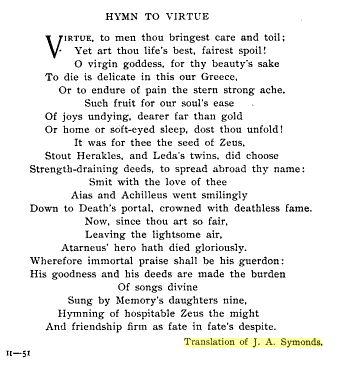 Aristotle is perhaps no great shakes as a poet, but the basic operation of his song is of a piece with what we have observed already in Alcaeus, Sappho, Pindar, and Solon. (And one should not forget that Aristotle was, in fact, admired in antiquity for his literary skill.) 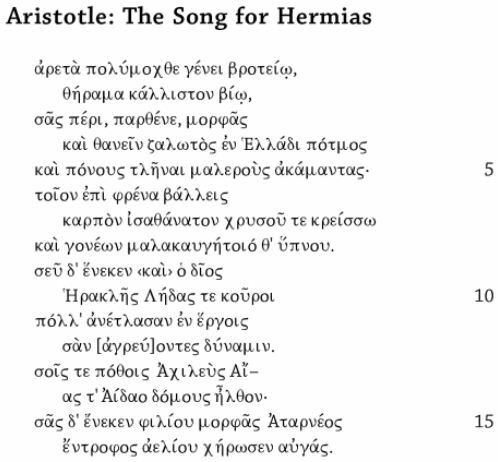 The art or technê that describes the principles of this song’s argumentation is clearly rhetoric, as Aristotle understands it, supplemented by the principles of versification, music, and song performance. So to know Aristotle’s poem, we might do well, if Walker is right, to know others who wrote Greek and were influences, literary influences, not only on Aristotle but on his audience. His poetry is “art” and more, art as argument. More context is required. More Greek is needed to know what he is doing or at the very least perhaps is intending to do to his readers, perhaps even to us, to you also, and to me too, if we can really count ourselves as reading Aristotle’s poetry. Let’s look at the letters at least. That fears no weary hour, shrinks from no fiery breath? More bland than spell of soft-eyed sleep. Thy glorious prize to grasp, to reach thy lofty height. The awe of Xenian Jove, and faithful friendship’s law. And now, problems and all, we might argue, we are reading Aristotle’s poetry of Excellence laborious for mortal kind. The expert we call Aristotle, when writing prose, preferred to call it ποιητικη.